A joint mission to Rwanda by two IFAD directors was welcomed by government counterparts and led to a fruitful dialogue on how to take IFAD’s engagement in the country to the next level. From 21 to 24 March 2016, Sana F.K. 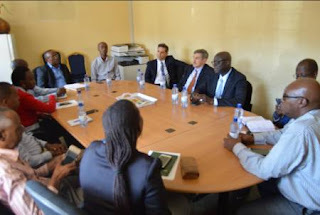 Jatta, Director, East and Southern Africa Division and Adolfo Brizzi, Director, Policy and Technical Advisory Division headed an IFAD delegation to visit Rwanda. They were accompanied by Francisco Pichon, IFAD Country Director for Tanzania and Country Programme Manager for Rwanda and Aimable Ntukanyagwe, Country Programme Officer based in IFAD Country in Rwanda. It was the first such joint visit by two IFAD Directors focusing exclusively on the Rwanda country programme. “This mission was an opportunity to demonstrate IFAD’s strong support and commitment to the Rwandan programme”, Jatta said. “We also reviewed with the government officials the status and possible future directions of IFAD’s engagement in Rwanda,” he added. In Kigali, the IFAD mission met with Geraldine Mukeshimana, Minister of Agriculture and Animal Resources (MINAGRI) and her staff, including the Permanent Secretary, directors, the coordinator and senior staff of the Single Project Implementation Unit (SPIU) for IFAD-funded projects in the country. The Rwandan officials were genuinely interested to discuss how to expand the partnership with IFAD, and to capitalize on lessons learned from the current programmes and projects in the country by bringing them to scale. The intensity of the conversation allowed the IFAD team to have a sense of how results-oriented the Rwandan Government is, with performance targets and indicators set for each political and civil service function within all government ministries. The outcome of various discussions in the capital is that the Government and IFAD fully agree that smallholder agriculture is a business. Both sides also recognize that dairy and livestock development, areas in which IFAD is developing a new programme, offer great opportunities for expansion and income-generation for smallholders. agencies and other development partners active in Rwanda. With the African Development Bank, given their emerging renewed focus on agriculture, possible areas of collaboration were identified as opportunities for partnership and cofinancing of projects in Rwanda. • a young household benefitting from the one cow per poor household programme under the “pass-on the gift” scheme implemented by Heifer International through a contract with KWAMP, combined with a flexi biogas digester that has proved very successful. The mission also visited a maize warehouse and drying floor funded under Climate Resilient Post Harvest and Agribusiness Support Project (PASP). In all these places, the IFAD team met and discussed with project participants, private millers and service providers about their experiences, and witnessed first-hand 4P schemes running successfully. Brizzi made a presentation on leveraging finance for smallholder agriculture and scaling up results to a large gathering chaired by Innocent Musabyimana, Permanent Secretary of the Ministry of Agriculture and Animal Resources. It was followed by a lively discussion. The presentation was attended by the CEO of the National Agriculture Export Board, representatives from the Rwanda Agriculture Board, all IFAD-funded projects teams, business development service providers, the Rwanda Business Development Fund, and others. The IFAD delegation concluded the visit to Rwanda by meeting Claver Gatete, Minister of Finance and Economic Planning and his team. The delegation thanked the Government of Rwanda for their support to the IFAD10 Replenishment and for the strong leadership in the successful implementation of IFAD-supported operations in the country. The implementation of the PASP was discussed and the Minister of Finance and Economic Planning challenged his own team to focus on expediting implementation, with the concerted effort of MINAGRI. This is the only project in the portfolio that has not picked up sufficient speed since its effectiveness in March 2014. “The very strong interest and attention provided to the IFAD team was another demonstration of the strong interest by the Government of Rwanda to see the partnership with IFAD become even stronger and go to the next level,” Jatta said. “It is worth noting that a good deal of the discussion as laid out by the Minister himself was a description of IFAD’s approach to leveraging private sector involvement in agriculture and the 4P model,” he added. “In his view, other donors should provide money to IFAD so that we can expand our scaling up potential especially through the mobilization of private partners, and our financial instruments to foster more inclusive markets,” Jatta concluded. Since this mission is unusual within IFAD, we approached Périn Saint Ange, Associate Vice President in charge of Programme Management Department to have his view. “The work in Rwanda is best practice. The joint East and Southern Africa Division and Policy and Technical Advisory Division Directors’ visit supported by Country Director for Tanzania and Country Programme Manager for Rwanda is also a very good way to engage with authorities and key partners at country level,” Saint Ange said.